A 2011 lawsuit over Texas’ beleaguered child welfare system has ping-ponged back and forth between an appeals court in New Orleans and a district court in Corpus Christi. 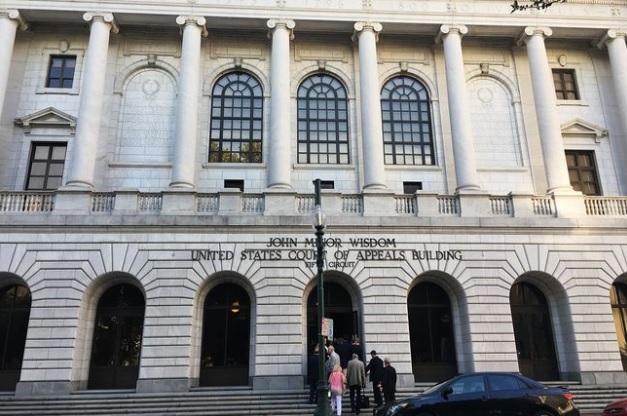 The John Minor Wisdom United States 5th Court of Appeals building in New Orleans, Louisiana, on Oct. 3, 2017. A federal appeals court on Thursday once again confirmed what advocates and lower courts have said for years: There are major, troubling flaws in Texas’ child welfare system. But the judges also struck down many specific remedies that a lower court had proposed to target those problems. In this week’s 103-page ruling, a divided three-judge panel of the 5th U.S. Circuit Court of Appeals affirmed several of Jack’s basic points — ordering that Texas must decrease caseloads for overburdened workers and shore up its system of monitoring foster care placements for safety. But the appeals court also pulled back many of Jack’s farthest-reaching measures, ruling some of her January order “goes well beyond what is necessary to achieve constitutional compliance.” For example, the court struck down a ban on placing foster children in large group homes. It also overruled orders intended to give kids access to social programs for transitioning out of care. The move gives state officials room to delay or avoid fixes advocates consider critical. “While the program still faces challenges, the Fifth Circuit upheld significant parts of the program as constitutional while finding that the district court engaged in judicial overreach in entering an overbroad and impractical injunction,” said Kayleigh Lovvorn, a spokeswoman for the Texas Attorney General’s Office. Lovvorn did not immediately say whether the state would appeal the decision. The appeals court appeared largely sympathetic to the idea that foster kids are often subjected to abuse — but it had a higher bar than Jack’s ruling did for what amounted to a violation of a child’s rights. So while the kinds of foster homes and facilities where kids are placed may at times be “suboptimal,” the judges wrote that Jack’s broad order was in many ways unworkable. A requirement that the child welfare agency make sure that long-term foster kids can get into driver’s education classes once a child is old enough to get a learner’s permit. The court also disputed Jack’s findings that foster group homes, a unique kind of placement that houses seven to 12 children who are not necessarily related, presented an undue risk of harm to foster children. The lower court initially banned the Department of Family and Protective Services from placing children in foster group homes unless they had 24-hour supervision, finding that children’s risk of neglect or abuse in those settings was so great, it violated their constitutional rights. The appeals court found that Jack’s analysis of group homes’ risks was “flawed.” Foster group homes, the judges wrote, are a “critical placement option for large sibling groups,” and pointed out that other states successfully place children in group homes without violating their civil rights. And it credited the state’s child welfare agency and the Texas Legislature for ordering changes over the lawsuit’s seven-year tenure. That was a win for the state, which has argued that a federal judge should not have the broad authority to tell a state agency how to do its job. Paxton has long characterized the lawsuit as a fight over states’ rights, criticizing Jack as an “unelected” judge. Jack and her court-ordered reform advocates “acted outside of their legal authority and ordered a plan that is both incomplete and impractical,” Paxton said of the lawsuit earlier this year.